There are a ton of things to like about cutting boards made by Epicurean. They are a company started by a couple of skateboarders, who decided to use recycled products to make cutting boards. They’re local to me, so I feel good about supporting a local business. Their product is really great and comes in a few innovative sizes. Lastly, if you live in the Twin Cities area you can get a great deal on a factory second. Epicurean was founded in 2003 by skateboarders who were making skating surfaces. They noticed they had leftover material from the manufacturing process. 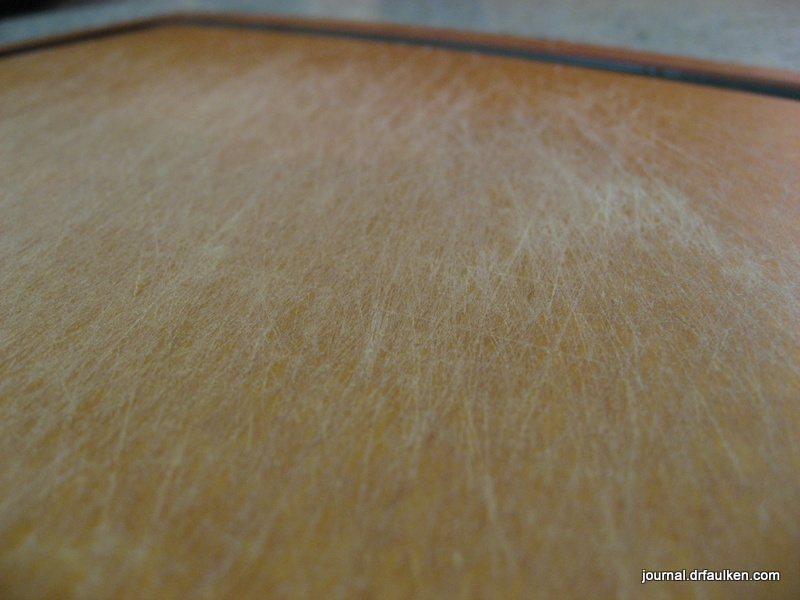 Instead of throwing the materials away, they analyzed the similarities between the skating surface and other commercially-available cutting boards. Over time they expanded their product offerings to include boards made out of recycled materials. The company is based out of Duluth, Minnesota. There are several lines of cutting boards from Epicurean. If I had to complain about something (and this is Gibberish, so you know I will), it’s that there are too many product lines, and trying to sort them all out is a bit confusing. As of this writing, there are 17 product lines, 18 if you count the kitchen island cutting board counter tops. 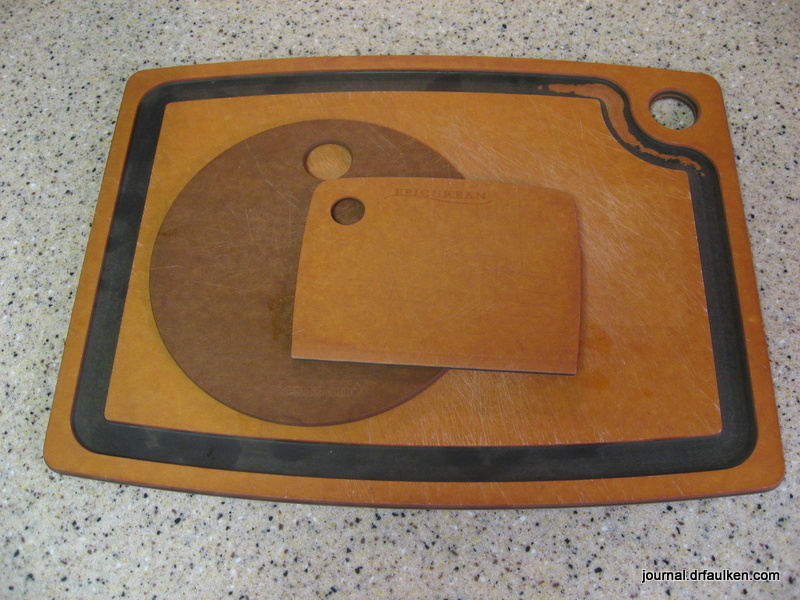 In addition, the Epicurean cutting boards are made out of four different materials. “Natural” boards are new material, “Nutmeg” is 50% recycled cardboard, “R100” is 100% recycled paper, and the “Eco Plastic” line is 100% recycled #2 milk jugs. All are made in the USA, and all are dishwasher safe. Every material except for the Eco Plastic are safe up to 350°F. The Natural and Nutmeg materials are made out of pressed, high density wood. The Natural line is certified by the National Sanitary Foundation to be nonporous and provides an excellent barrier to bacteria. This is nifty, but since we run our cutting boards through the dishwasher on a regular basis it’s not a critical product feature. All three of our boards are factory seconds. Local Minnesota company EverSharp Knives sells first quality and factory seconds at their store. The factory seconds are about half off of retail and the flaws are just strictly cosmetic. In our case, the Gourmet board we own has an inconsistent application of color near the accessory hole. Apparently the Gourmet board has a slate core, so perhaps there’s something off about this board’s core. We have no idea what is “wrong” with our other two boards. Speaking of the Gourmet board — we use this for larger cutting tasks, like taking down a chicken or cutting up flank steak. One of the things we like the most about it are the runnels. This helps keep blood from the meat from spilling onto the counter. As you can tell from this picture, the material is very knife friendly. Some people buy super durable cutting boards that resist cuts from knives. This might be great for your cutting board, but is terrible for your knives. Something has to give, and I’d rather it be an inexpensive cutting surface than our Wusthof or Henckel knives. 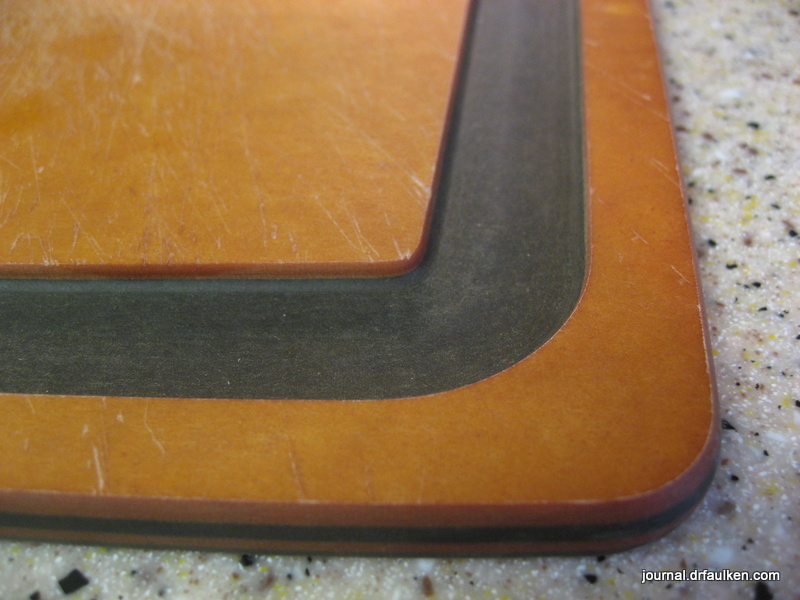 One of our cutting boards is from the Nutmeg material line. We use it just the same as the two Natural boards, and can’t discern a difference between the leftover wood used in the Natural line versus the 50% recycled cardboard used in the Nutmeg material. We get a ton of usage out of the smallest board, which is technically a scraper. We cut a lot of fruit in the house and it’s so much easier to use and clean the smaller board than the heavier Gourmet board. I think we paid like $5 for it, and it’s one of the most used implements in our kitchen. I can’t find it on Amazon, but I highly recommend this form factor if you cut smaller fruits and vegetables, bits-o-meat, or cheese. The wood used in the boards has a smooth surface but still stays anchored during use. Sedagive? puts a damp cotton towel underneath the boards for extra stability, but I haven’t found this to be necessary. We spent about $45 for all of our boards, and I am very very pleased with them. We like the Epicurean products so much we bought some utensils made out of the Nutmeg recycled material, which were also pretty affordable. If you can find the boards as factory seconds their price-to-performance ratio goes up even more. I’ve contacted EverSharp Knives to see if they will offer the seconds online, and I will let you know if they do. The Epicurean boards are great for yourself or as a gift for someone who spends a lot of time in the kitchen.